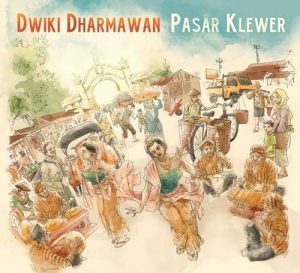 Dwiki Dharmawan’s international debut “So Far So Close ” was a retrofuturistic wonder in its use of cosmic synthesizers, but “Pasar Klewer” basks in a different kind of glory, with acoustic piano – the maestro’s only instrument of choice now – lending these two discs a classical tincture. Tangible from the start of the title track, though, DD’s recital mindset is increasingly stricken with Indonesian melodies which coil around the serpentine rhythms that Asaf Sirkis and Yaron Stavi weave throughout the album. Time signatures are in constant motion here, yet while the presence of gamelan and Gilad Atzmon’s sax on the incidental-to-sublime “Tjampuhan” (think Satie in the jungle) can’t be surprising, the blues of Robert Wyatt’s “Forest” – first voiced by Boris Savoldelli and then cleansed acoustically as the record’s finale, with Mark Wingfield’s six-string lace – brings on a rather unexpected delight. Dwiki may get behind his band and still delicately drive the melancholy of “Bubuyu Bulan” and the Eastern excitement of “Spirit Of Peace” before floating to the piece’s jazzy surface, but his tradition-rooted sensuality is all over “Lir Ilir” whose female vocals set the scene for an impressionistic rumination and baroque dance. It’s laced with Nicolas Meier’s acoustic guitar, the instrument in the heart of “Purnama,” whereas “Frog Dance” demonstrates Dharmawan’s bossa-tinged commercial nous, so not for nothing a market is referenced in the album’s title: there’s real romanticism in store here, in all its arresting variety, to be felt and grasped again and again.